I watched THE HUNGER GAMES: MOCKINGJAY PART 1 (2014) in theaters on 12.28.14. It was my first viewing of the film. MOCKINGJAY is the first film in the HUNGER GAMES series to ditch the idea of the Games altogether. This film focuses, instead, on District 13 (previously only alluded to and never seen) as Katniss (Jennifer Lawrence) becomes a vital cog in the revolutionary machine. The villainous President Snow (Donald Sutherland) is doing grandly evil things. The leader of the revolution, President Coin (Julianne Moore), needs Katniss to whip potential rebels into a revolutionary frenzy. This movie is largely political, with small bits of contained action. Katniss gets into a scuffle in District 8, but most of this movie is about preparation or, as President Snow repeats “moves and counter moves”. This is one of those movies, then, that is about prepping for the final chapter. This is barely a stand alone film, with the rescuing of Peeta (Josh Hutcherson) feeling like it is made into a larger deal than it should be because that is really the only beginning to end story in the film. The plot of this movie is a less solid than others. There is an attack on District 13 which is inexplicably cut short. Where the previous movies did a nice job of creating a reality where the idea of why characters live or die always made sense, MOCKINGJAY feels like people live or die as a convenience to the story rather than due to motivated actions. Due to these developments, this is the first time one of these movies feels forced. Which isn’t to say the actors don’t continue to do a lot of good work. 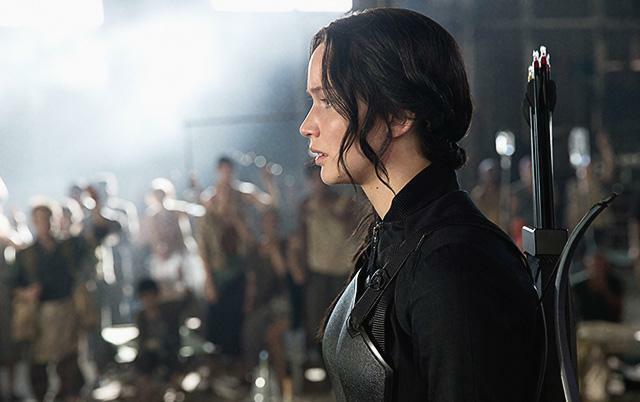 Lawrence is effective as ever as Katniss, and she is asked to do a lot of crying in this one. Sutherland is hatable. Moore is a woman trying to figure out the nuances of her power. Both Philip Seymour Hoffman and Woody Harrelson shine in their returning roles. Watching Hoffman in one of his final performances is a sad thing, he’s so good even in this sort of Hollywood blockbuster sort of thing. Harrelson has more fun in this one as the now-sober Haymitch. Elizabeth Banks does more fine work as the newly de-wigged Effie. The filmmaking in this movie is uninteresting. There are some nice exteriors, and the detailing in the small details like Effie’s wardrobe are still there. But the work of Director Francis Lawrence, who took over the series starting with CATCHING FIRE, is dedicated entirely to story. There is no flare in the style. Everything, from the plotted story to the visual story feels like the easiest path from Point A to Point B. Ultimately, this feels like a slightly underwhelming final product. The movie here may well set up a power house of a final film, and there is no reason to think it won’t. But on it’s own merits, MOCKINGJAY PART 1 is the least successful HUNGER GAMES film yet. It’s not bad, it’s still enjoyable. It is just hard to reach any final conclusions about it until the last one comes out next year. ~ by johnlink00 on December 30, 2014. Felt like an obvious ploy for money. Wasn’t like that the whole duration, but the ending and the way it was so abrupt made it feel as such. Good review John.